Flip Out Mama: Baby Shower Bash: Super Baby Food! Baby Shower Bash: Super Baby Food! 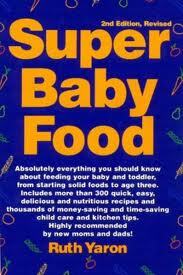 Our next Baby Shower Bash sponsor is a wonderful book called Super Baby Food! This book is pretty much the Bible of Baby Food! It contains everything you need to know about feeding your baby. This book is a must-have for new parents, as it discusses what, when, and how much to feed your baby and toddler. It also has tons of info on making your own baby food, which is great! Ruth Yaron is the author of Super Baby Food. In 1985, her twin boys were born ten weeks early and very sick. This is what prompted her to take control of their nutrition and learn everything she could about infant and pediatric nutrition. This is where the idea for the Super Baby Food book came about, so that she could share these wonderful things that she had learn with other moms! 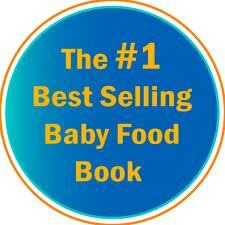 I know that the Super Baby Food Book will come in especially handy for Crystal and baby Sadie! It covers the importance of mealtimes and also has a month by month guide to introducing new foods. It also has a guide that tells approximately how much food/liquid your baby should be eating or drinking. This is especially helpful for new moms who don't really have a clue as to what is "normal". A big thank you to Ruth and Super Baby Food for sponsoring our Baby Shower Bash! disclosure: I received a sample product in exchange for this post. Although a sample product was received, all opinions are my own, and no monetary compensation was received. WW: This Is The Life. Nordic Ware has my Heart. My Favorite Thing About Easter! Have You Ever Heard Of: A Kiddie Pool Garden? Are you a blogger? Do you like Gift Cards? Socks 4 Life Review and Giveaway! Can't Believe My Baby's Almost ONE!! Kids and Their Weird Favorite Things. WW: My Little Grown Up. Umi Shoes New Spring Line Will Rock Your Socks! Tiger Balm Review and Giveaway! Can't Believe I'm Thinking About This. Germ Guardian: You Humidified Me When I Was Down. Baby Shower Bash: Diaper Cakes By Wendy! Baby Shower Bash: Baby Dipper! Will We Ever Get Better?